Does your school have Kid Pix 3D software? Good news! TechnoKids has a new collection of Kid Pix 3D teaching ideas designed for Grades 1 to 3. Kid Pix 3D is great fun for students to play and explore. Now you can take them to the next level. Teach curriculum objectives and integrate technology skills as you provide engaging challenges for students. TechnoKids Kid Pix activities are meaningful and relevant tasks such as maps, brochures, pictographs, timelines, poems, posters, postcards, board games, slide shows, videos and more! Combine the wow factor of Kid Pix with the curriculum outcomes students need to learn. The Kid Pix 3D Activity Booklet has 20 brand-new, creative lesson plans. Each self-contained activity has illustrated, step-by-step instructions on a two-sided card. They can be used in any order and teachers can complete one or all of them. A technology integration table defines the curriculum areas and specific outcomes achieved by each activity: language arts, social studies, science, mathematics, and creative arts. In addition, a technology skills table specifies the computer skills attained with the completion of the task. 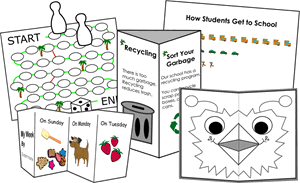 Included with each activity are sample files to show teachers and students possible products as well as provide inspiration. Turn your primary students into Kid Pix 3D power users! The workshops teach specific tools, all of their features, and helpful tips and tricks. Illustrated instructions help students master tools in advance of using them in an activity. Or, students can complete all the workshops and become Kid Pix 3D experts. Discover new ways to use this popular drawing and creativity tool to capture your students’ imaginations. Empower and inspire them with authentic, meaningful, and innovative tasks. TechnoKids’ Kid Pix 3D Activity Book has just been released and can be yours right away as a digital download, with the Kid Pix Bundle, or included with the complete TechnoKids Microsoft Extra package. Do you like Kid Pix 3D? Here is a fun language arts activity you can do with your students! Compose an acrostic poem with moving letters. An acrostic poem has the first letter of each line spell out the topic name down the left side of the page. Each line of poetry begins with one of the letters and relates to the topic. I like to eat lots of slices. Zip each into my mouth. Me: Write your name down the left side of the page. For each letter, write a word that describes your personality. I Like: Write something that you like down the left side of the page. For each letter, write a word to describe it, reason it is your favorite, or other words related with the item. Story Character: Write the name of a character from a story. For each letter, describe their appearance, character traits, behavior, or other important details. TIP: It is a good idea to pick a topic name that is one word and is less than seven letters. Click 2D Animations. Choose the Alphabet category. Find the first letter of the topic name. Drag it onto the drawing area. Place it at the TOP left side of the page. Continue to add letters until the word is spelled out. Add letters along the left side of the page to spell the word. Click beside the first letter. Type a word or phrase about the topic. Add each line of poetry. Use your skills to make the text look great! For each letter, type a word or phrase about the topic. Click Play Picture to see the poem animate. Save and Print the Animated Acrostic: You may want to set the frame for each letter, so the word can be read when printed. Position the mouse pointer at the VERY TOP of the screen. When you see a black triangle, click the mouse. From the File menu, click Export. Pick a location to save the file. Type poem as the file name. Click the Save as type arrow and select Quicktime Movie. The movie is created. It opens in a video player when it is finished. TIP: You may need to Quit Kid Pix 3D to watch the video. This is just one of the 20 activities and 10 workshops in TechnoKids’ KIDPIX 3D Activity Book. It is also available with 5 additional KIDPIX 3D projects as part of the KIDPIX 3D Bundle.